Vice Principals could have had so much going for it but it decided to go for cheap laughs, a tired plot, and characters that just don’t work. HBO is known for its award-winning television series and movies, so when one receives a Blu-ray from them, you can usually expect great things. Gripping stories, excellent production values, terrific cast and something that you would want to watch over and over again. Sadly, Vice Principals is probably one of the lower points of HBO's Original line up. Full of cursing and cliched characters, it doesn't immediately grab the audience, so all nine episodes are more of a chore to watch than a pleasure. Neal Gamby (Danny McBride; Rock the Kasbah) and Lee Russell (Walton Goggins; American Ultra) are both vice principals in the same high school in South Carolina. When their principal decides to retire to take care of his ailing wife, both men start vying to be his replacement. Adding to the drama is the fact that both men despise each other and plan to fire the other one as their first order of business as the new school principal. Imagine their shock when the school board decides to promote neither of them but instead brings someone in from the outside, Dr. Belinda Brown (Kimberly Herbert Gregory; White Alligator). Suddenly, these enemies find themselves as frenemies with a common goal – to get Dr. Brown fired. They spend the next several months plotting and scheming together, reluctantly, to get her ousted so one of them can take over. Of course, once that happens, they vow to go back to being enemies. The premise of the show is interesting enough but the script and execution are simply lacking. Creators tried to infuse some other aspects by making Gamby a divorced single father and by giving Russell an Asian wife and mother-in-law, the latter of which does nothing more than yell at him in Korean? Chinese? I'm not exactly sure. While one would think these details would make for some comedic gold, they don't. In fact, nothing about the show is funny. The jokes fall flat and are stereotypical, so nothing is fresh or unique. The dialogue is riddled with cursing to the point that in some scenes the audience can go on for minutes without hearing anything but curses. Someone needs to tell the writers that bombarding a show with continual cursing doesn't make it funny. McBride is a cliche and adds nothing to the show. He is completely unlikeable, which made me route for his firing. Goggins is somewhat better but only marginally. However, I will say seeing him in this role as opposed to his character in American Ultra is quite a change and shows his range as an actor. Gregory is the best of the bunch and I found many of her scenes to be enjoyable. Perhaps she was well cast, which makes her stand out among the rest. The Blu-ray is presented in 1080p high definition video with a 1.78:1 aspect ratio. The picture quality is what you would expect but the greenery of the forest near the school certainly has a range of hues, which shows off the woods beautifully. The DTS-HD Master 5.1audio is clear with full body sound. The combo pack comes with the Blu-ray and digital code but no DVD. There are a few extras for each episode, including deleted scenes and 9 unique audio commentaries with cast and crew. The other extra is a decidedly unfunny gag reel that is 5 minutes long. Vice Principals could have had so much going for it but it decided to go for cheap laughs, a tired plot, and characters that just don't work. They have been renewed for a second season but if they don't make some changes this time, I can't imagine them lasting for a third season. Download The Complete First Season from the iTunes Store in Digial HD. 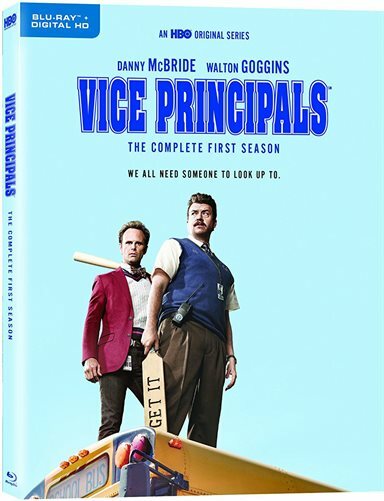 For more information about Vice Principals visit the FlickDirect Movie Database.